As they gear up for a summer of splashing, swimming and sliding, waterparks from coast to coast are making sure safety is priority number one. “We have a robust and multi-layered training program to ensure safety,” said Nancy Kaiser, who oversees the Antioch Water Park, northern California’s oldest such attraction, as director of recreation and parks for the Antioch Recreation Department. 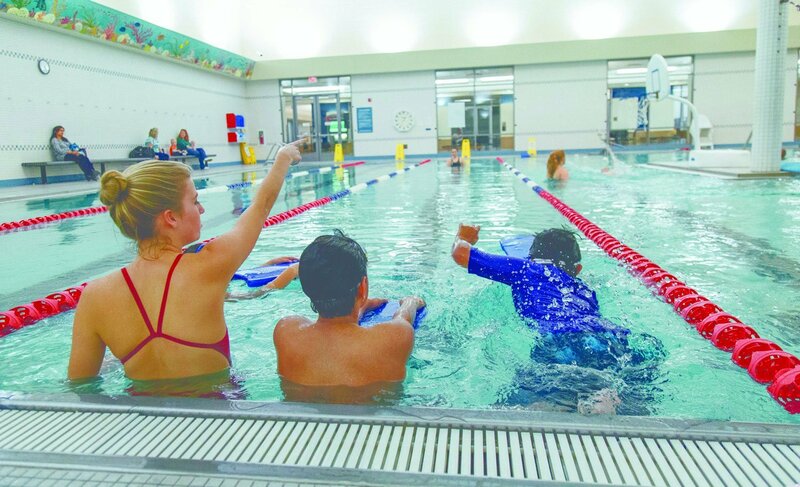 Water Safety Instructor Julia Douglas, with two swimmers, at the Troy Community Center in Troy, Mich. The facility’s recreation supervisor said safe operations can depend on management’s hiring of adequate personnel. The largest youth employer in the region, Antioch hires 150 seasonal staffers for the waterpark; all of them must participate in a rigorous safety program. The program includes team training, one-on-one in-service training, physical exercises, classroom work, and continuing education to make sure employees are prepared for any situation. Staff training and protocols like Antioch’s are at the heart of waterpark safety, and many of those protocols are a matter of law. In Wichita Falls, Texas, Park Manager Steve Vaughn said Texas, like many states, requires four hours of monthly in-service training for his lifeguards at Castaway Cove Water Park, which hosts about 100,000 visitors annually. Water rescue drills are part of the routine at Summit Aquatics Center in Canton, Mich., where guests of all ages come to enjoy the lazy river, water slide and spa with sauna. “We’ll do simulations of heat-related or cold-related injuries, and we’ll cover evacuations in severe weather,” said Aquatics Specialist Assistant Christa Williams. 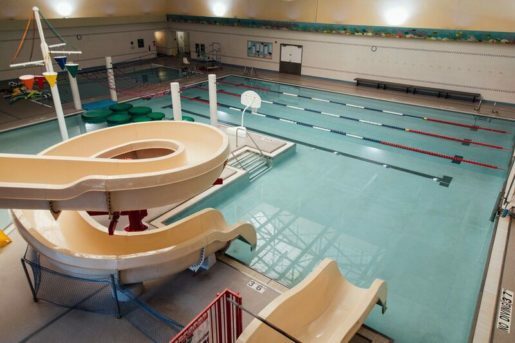 A water slide at Troy Community Center. The recreation supervisor said safety equipment must be well maintained and easily accessible. Drills, simulations and other situational exercises are common strategies for reinforcing security protocols. 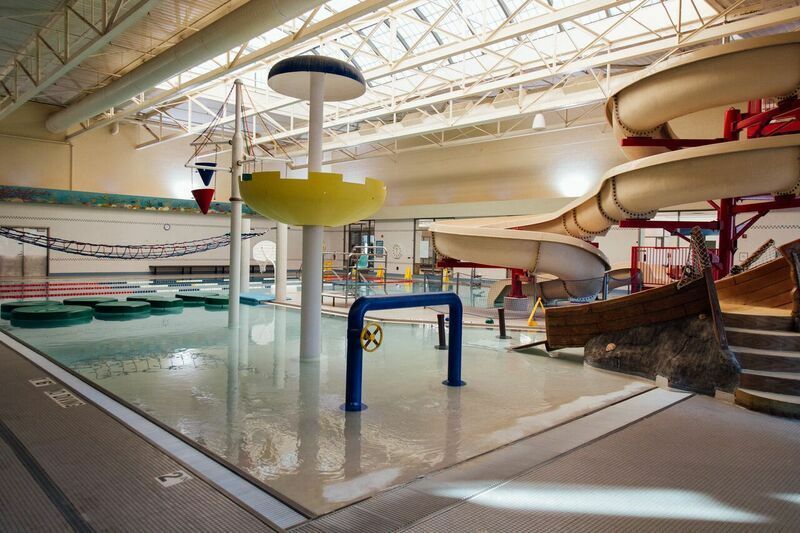 But Kelly Molinar, the recreation supervisor for Troy Community Center’s indoor waterpark in Troy, Mich., said safety also depends on management, which must hire and position adequate personnel. “We staff our facility so that there are no blind spots,” Molinar explained. The Split Rock Resort lifeguard team is certified by the National Aquatic Safety Company which trains the resort’s supervisors on-site, Baldassari said. He added that the staff is also responsible for daily and hourly maintenance checks of the pools and water slides — another layer to the safety protocol. “Every day before we open, we do a walk-through and safety check of the entire park to make sure [everything is] in safe working condition,” said Baldassari. Like other aquatic facilities, the Split Rock team tests the water every few hours to ensure that chlorine levels and Ph are correct — a regimen that in many states is required by law. “We also have a high-tech air quality ventilation system,” said Baldassari. The waterpark at Troy Community Center. The facility welcomes 1.5 million visitors annually. At the Antioch Water Park, Nancy Kaiser puts her staff through a similar protocol. “We have all the checks and balances in place that are standard in this industry,” she said, noting that clean, working facilities are essential for safety. The waterpark’s physical design and layout is another factor, Kaiser observed. She noted that Antioch’s lockers are deliberately located near the main lobby, “so if a customer needs help right away, there’s quick access by staff.” In response to families’ desire for more kid-safe recreation options, Antioch is planning a new spray ground installation for its 22nd season in 2017, giving the littlest visitors a low-risk zone to splash in. Many waterparks have grooved concrete or another textured surface for traction, reducing the risk for accidents. At the Troy aquatics facility, which welcomes 1.5 million visitors annually, Molinar pointed to the importance of safety equipment that is well maintained and easily accessible: flotation tubes, crooks, and rings. Park officials also emphasized that the visitors themselves are responsible for safety — which is why they post highly visible signs reminding guests of rules, warning bathers of off-limits areas and prohibiting unsafe activities. “We have a lot of basic signs around to remind both the staff and our guests — no running, no diving, things like that, that we highly enforce,” said Christa Williams. Molinar agreed, adding that parental supervision is essential. “One of our lifeguards’ responsibilities is making sure that parents are in the pool with kids at all times,” she said.